One reason why Grey’s Anatomy is still on the air in its 13th season is due to over-the-top allegories like this one. A building, i.e. the world, collapses, and the survivors and relatives of the non-survivors are left to pick up the pieces, and most vitally important this episode: who to blame. I’m pretty sure that according to Grey’s Anatomy’s filming schedule, there’s no way this episode could have possibly been written after the election, but there are a lot of parallels. How do we get up and keep going onward when there’s no tomorrow? If catastrophe happens, is there someone in particular we can blame, or are we all to blame? If something’s going on we don’t like, can we band together and make a movement to stop it? Because it’s Grey’s, and Shonda Rhimes, again this all gets broken down granularly to someone we really care about. Alex Karev is left to carry the weight of a destroyed building on his shoulders, as he considers taking a bullet for Jo that will land him in prison for two years. 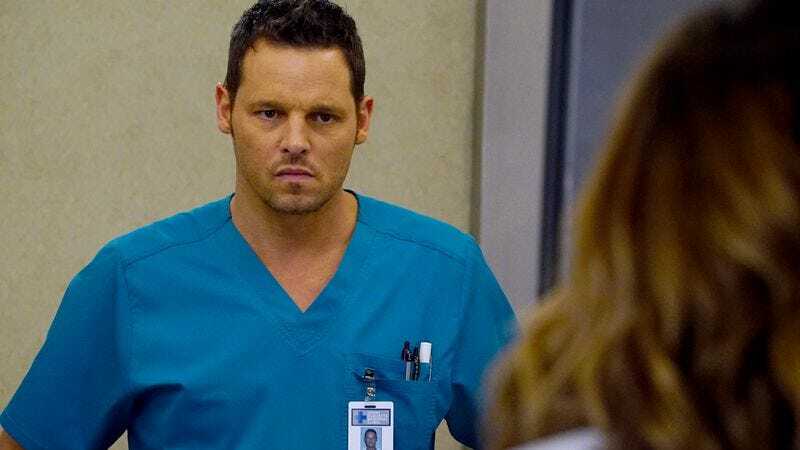 If Justin Chambers wants to take a break after over a decade as the lead on a network ensemble drama, we can hardly blame him. But still, it’s a huge loss for the show, as Meredith herself points out, she and Alex are the only two original interns left. Bailey and Richard still remain from day one, and in a cast of what seems to be at least 20 people, I think that’s it? As she scrubs in, Meredith seems to be pondering what we all are: How much in this hellscape world is she supposed to take? She’s lost just about everyone in her life, and now her best friend? We can’t put it past Rhimes either way as far as Alex’s fate goes. Remember that final shot of Izzy getting into an elevator with George, when both of their fates were up in the air? (Izzy survived. Surprisingly, apparently a major character on How To Get Away With Murder did not tonight.) I would guess that he does leave, because the ability to go out a hero, and in a way that aligns with earlier knowledge about his character, looks like too much of a setup for Rhimes not to just go ahead with it. But with Alex gone, that makes Owen our next most-veteran character, and it feels like he got here about yesterday. So maybe it’s time to wrap it up. Last season, Grey’s showed some sparks of life with some innovative and experimental episodes, but we haven‘t seen any of that so far this season. Instead we‘ve just seen more of the same: Maggie freaking out about boys like a 12-year-old, April and Jackson figuring out their relationship, Ben and Miranda arguing about church vs. state. Richard’s dilemma is the same as the show’s: Grey-Sloan has to move forward to survive, even if the status quo protests. The problem is that everyone seems pretty comfortable with the way that things are. But Miranda thinks she’s doing what’s right for the residency program, and we know she’s trustworthy. The resulting showdown between the two sides might help up the ante for Grey’s return in 2017. When something terrible happens, we look quickly for a scapegoat, just like the grieving mother who wants to unplug the landlord’s life support. Alex, in his way, has been blaming almost everyone else for his current predicament, but once Jo explains that her life will be in danger after she testifies, he’s willing to take the blame for his own actions. Even Amelia’s note to Owen urges him not blame himself, as he is wont to do (and their split, as I’ve said, seems like an unbelievably cruel thing to do to his character). The cheating husband receives his comeuppance at the hospital, because karma will out. Still, Grey’s seems to say here, horrible things are going to happen. Buildings are going to collapse. Husbands cheat. People lose their temper. The important thing is that we own up to what we’ve done. Only then can we truly move on. Just like Karev appears to be doing this episode. Maggie was kind of bearable this episode when she wanted to stick up for Richard and urged him to fight for his job. If only she could use her powers for good! If Amelia is really leaving, couldn’t she give Meredith a heads-up as well? Seems harsh for her to lose Alex and Derek’s sister in the same episode. I know we usually do discussion posts, but thought this “winter finale” deserved a review. Grey’s Anatomy returns on January 19.